Posted on Saturday, August 7th, 2010 at 11:30 am. 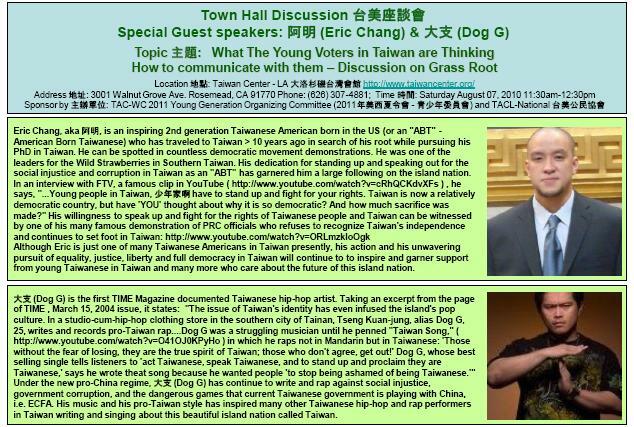 Although Eric is just one of many Taiwanese Americans in Taiwan presently, his action and his unwavering pursuit of equality, justice, liberty and full democracy in Taiwan will continue to to inspire and garner support from young Taiwanese in Taiwan and many more who care about the future of this island nation. Under the new pro-China regime, 大支 (Dog G) has continue to write and rap against social injustice, government corruption, and the dangerous games that current Taiwanese government is playing with China, i.e. ECFA. His music and his pro-Taiwan style has inspired many other Taiwanese hip-hop and rap performers in Taiwan writing and singing about this beautiful island nation called Taiwan. Maybe Eric can address why he thinks it’s OK to use the word “chink” in responses to negative comments on his YouTube channel (http://www.youtube.com/watch?v=-cj3fLgjLXM, http://www.youtube.com/watch?v=-cj3fLgjLXM). Perhaps he thinks he is “reclaiming” the term or that it’s OK because he is (presumably) using it to address people in China… but I think it demonstrates an ignorance of Asian American history that ultimately undermines his work. i use a lot of other negative words on my channel besides chink, but only on my comments and only after people come at me first. i’m definitely not trying to reclaim the word. i personally believe in freedom of speech, so i fully support anyone using whatever language or words they choose. i make my videos not to address asian american issues in anyway, but to address issues that are occurring in taiwan. being taiwanese, our history is separate from china’s history. i make my videos to bring attention to what is happening in taiwan and taiwan alone. i personally don’t think you can lump taiwanese-americans and chinese-americans together under just asian-americans considering the situation between taiwan and china.